Echo Park is a place where stops signs tagged “ExP” (Echo Park Locos) and “CRS” (The Crazys) share blocks with happy hour chalkboards hawking “PBR,” so it’s perhaps unsurprising that locals reacted with mixed feelings late last month when former city attorney Carmen Trutanich applied for an injunction against six neighborhood gangs, prohibiting known members from associating with each other in a 3.8 mile area (with some exceptions). When a bunch of Frogtown members jump and rob a cyclist on the river path or a Diamond Street Loco misses his target and instead kills a 4-year-old, newcomers and longtime residents share anguish and frustration, but gangs have been in Echo Park for so long that for some residents who grew up in the neighborhood they are part of the fabric of the community. Here’s what we know about the six gangs named in the injunction: Echo Park Locos, Diamond Street Locos, Frogtown, Crazys, Head Hunters, and Big Top Locos. The Diamond Street Locos made their first appearance in the Los Angeles Times in 1973—as victims: An unarmed 17-year-old kid, an alleged Diamond Street member, was shot dead by a school security guard at Belmont High School in Westlake. The kid had been suspended from Belmont but returned to the school and an altercation with the guard ensued. The security guard was transferred but kept his job, sparking Chicano activists to organize walkouts. By 1979 the gang was committing “rat pack” assaults, in which 35 to 40 members would quickly attack, for example, a group of guards outside a Downtown Bank of America. The gang’s leader, a 19-year-old named Juan “Fat Johnny” Contreras, was arrested during one of the assaults and sentenced in the early 1980s. In 1980 Diamond Street and a few other gangs made an unlikely ally: the neighborhood’s gay community. In the late ‘70s, gay men were victims of hate-fueled attacks by gang members. Gay community activists reached out to gang leaders and Diamond Street responded, ultimately joining forces to help organize the Sunset Junction Street Fair, which was successful for more than 30 years (until 2011 when organizers filed for bankruptcy). These warm-fuzzy fairs didn’t stop Diamond Street members from driving out to Santa Ana to murder members of a rival gang, F Troop, several times throughout the ‘80s. Or from killing an Echo Park 4-year-old with a stray bullet. Echo Park Locos have dominated the neighborhood for decades. They are so embedded in the community that the line between organized criminals and civic leaders often blurs. This was probably most apparent in 2009 when Eric Zamarripa was murdered. An Echo Park Loco shot Zamarripa, a leader of the same gang, in front of his home on Baxter Street. Eastsider LA ran an interesting profile and the police held a public meeting to discuss his death. The public response portion of the meeting (also covered by Eastsider) was tense, with racial, anti-gentrification, and anti-gang undertones. Zamarripa was characterized as both a community leader and a creep. He was a family man who hosted big block parties at his home. He was also allegedly leading a gang responsible for violence and drug crimes in the neighborhood. Incidentally, several of the Echo Park Locos involved in the Zamarripa incident lived outside of Echo Park. Apparently, even the guys who rep Echo Park leave or get pushed out by gentrification to Highland Park and Pasadena. This old school gang takes its name from the antiquated slang for the riverside Elysian Valley section of Echo Park, where thousands of frogs used to croak from the banks of the river. In the early ‘90s Frogtown residents started referring to the neighborhood as Elysian Valley to avoid the damning association with the gang, according to the Los Angeles Times. Today Frogtown’s gang name is losing its edge; residents are starting to call it Frogtown again and the Frogtown Artwalk gets about as much press as the gang these days. The Big Top Locos were first mentioned in the Los Angeles Times in the late ‘80s and have been tied to some recent shootings. Little else is known about them. Big Top Locos was also the name of a music festival held in the summers of 1994 and 1995, featuring Rage Against the Machine lead singer Zach De La Rocha. The event was meant to support children affected by political revolution that occurred in the Mexican state of Chiapas. It’s unclear if the gang and the festival are or were related, but the name is pretty unique. Of the six gangs named in the injunction, The Head Hunters are best at staying under the radar. However the gang made news in 2008 when one member allegedly fired shots at a man he believed had called the police on the gang. Unlike the other gangs on this list, The Crazys have a large gang history throughout the city of Los Angeles. 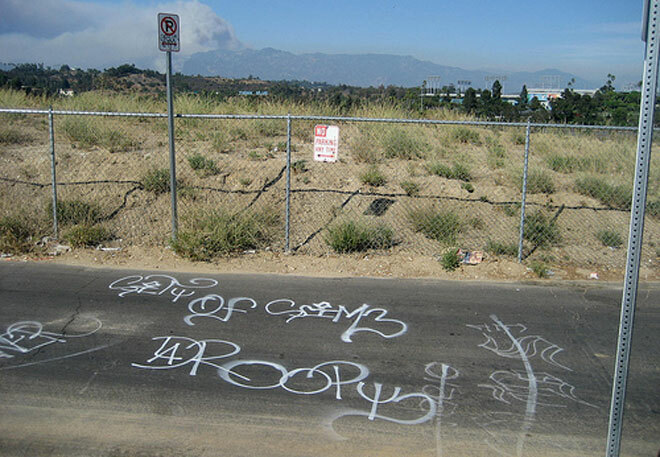 Their Echo Park connection includes some initiation assaults on Sunset and Alvarado and a tagging war they waged against the Echo Park Locos in 2010.